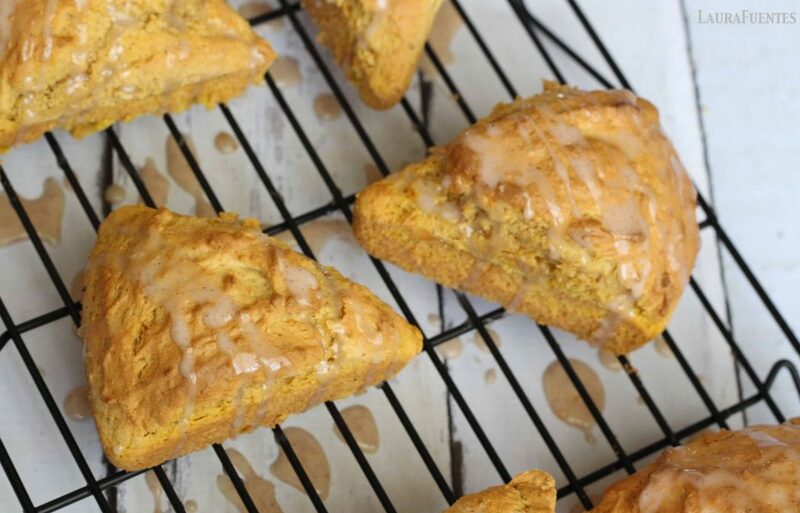 If you love pumpkin scones, you are in for a treat today! 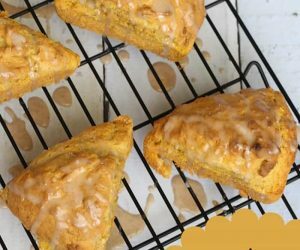 I combined my 3 favorite versions for pumpkin scones into a single post (see all 3 recipes below). Pictured are the gluten free scones, although the ones in the original recipe come out looking the same. The paleo/grain free version is just as delicious (or more). 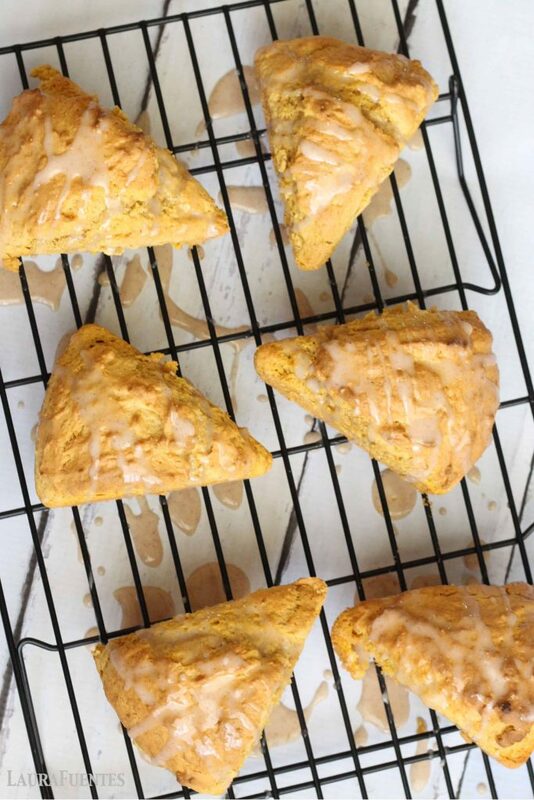 You should know, my love for pumpkin scones has no limit. It helps that my family also loves scones and this is the perfect recipe to use up that leftover 1/2 a can from something else “pumpkin” like this legendary pumpkin brownie recipe! I also love fall because of the abundance of fresh apples, the scent of cinnamon flavors that inundate my house and of course, pumpkin! I know, what you must be thinking… she just told us the other day that she loved apples, then it was pancakes, then it was cinnamon, and now pumpkin? Ok, ok. I love everything food. But these scones are special. They were developed after the Cranberry Scones (copycat Starbucks recipe). My kids love them and they are a once-in-a-while treat. 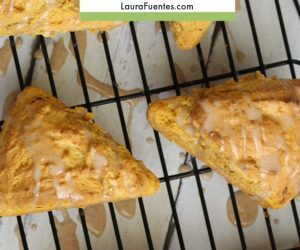 I almost didn’t share this recipe -even though I had these scones photographed after one of my Saturday morning breakfast bake sessions -which meant that I had less than 5 minutes to take these photos while 3 hungry kiddos were waiting by the sidelines. Since I took these photos, I’ve gone grain-free, my middle son is on a gluten-free diet, and everyone else eats the “original” version. How do I make all of them at once? I pre-make the doughs for all 3 recipes and freeze the scones on a cookie sheet. I bag each scone according to its type and I pull them out when I need to bake them. The original and the gluten free recipes bake at the same temperature, so this makes it really easy! The grain free/paleo version is at a lower temperature and I don’t shape them like triangles -although I am sure you could. I make them round so I know that they are the paleo ones when I search for something to bake in my freezer. As you can see, I know just how hard it is when everyone has different dietary needs. Not every meal is as accommodating as these scones and all too often switching up your own diet can mean making multiple meals at every meal. This is why I created the Family KickStart Program. It allows your whole family to join you in eating nutritious, great-for-you meals that they will all love. Since the meal plans in Family KickStart are presented with 2 stages you can even be fully Paleo while the rest of the family enjoys the exact same recipe, modified down a bit for their own dietary needs. If you haven’t heard of the Family KickStart Program, it’s my 30-day program that helps families eat clean, fresh food together. Every recipe in Family KickStart is gluten free and kid-friendly, making it the only whole-food eating plan created with the entire family in mind. Learn more about Family KickStart here. 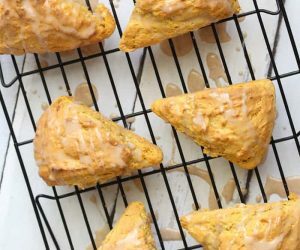 That said, pumpkin scones are a family favorite and after I’ve shared them on Instagram and my social channels, people still email me and ask me “when are you going to share that pumpkin scone recipe?” So here it goes. Everyone should be covered with this recipe! The glaze is optional. I usually half the glaze recipe and I “drizzle” it. 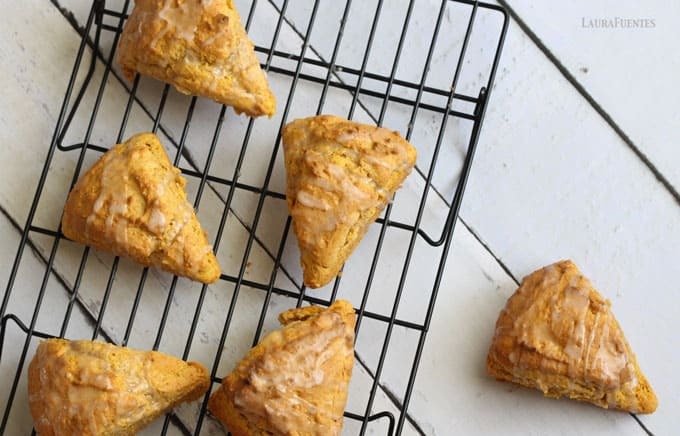 These scones are great for a fall treat. However, if you love scones as much as I do, make these year-round. Combine flour, sugar, baking powder, salt and spices inside a sifter and sift onto a large bowl or the bowl of your stand mixer. Give it a whirl to combine. Using a cheese grater, grate your butter into the dry mixture. Combine shredded butter and dry ingredients with your hands until there are no large lumps. In a medium bowl mix pumpkin, half & half, and egg. Fold wet ingredients into dry ingredients -if they aren’t combining well, turn on the mixer on low and mix it well (do not over mix). The dough won’t be dry, it’s a bit sticky. Remove dough onto a lightly floured surface and make a large round circle. cut into 6 or 8 triangles and place onto lined baking sheet (or into your scone pan). Bake 14-16 minutes until they are light brown. Remove from oven and allow them to cool. Mix powdered sugar, milk and spices. Once scones have cooled, drizzle with glaze. Let glaze harden and enjoy. I always keep a stick of butter in the freezer for making scones. If you don’t have one, make sure your butter is very cold; otherwise, it will be very difficult to grate. If you want to use pumpkin pie spice, omit all other spices and use 1 1/2 – 2 teaspoons. This recipe works well with an all-purpose gluten-free flour (like King Arthur flour, Bob’s Red Mill, Cup4Cup). For those of you who like to make your own gluten-free flour mixes, this is the recipe you’ll wan to use. Combine flour, starch, sugar, xanthan gum, baking powder, baking soda, salt and pumpkin spice inside a sifter and sift onto a large bowl –or the bowl of your stand mixer. Give it a whirl to combine. In a medium bowl mix pumpkin, half & half, and egg. Fold wet ingredients into dry ingredients -if they aren’t combining well, turn on the mixer on low and mix it well (do not over mix). Remove dough onto a lightly floured surface (with brown rice or tapioca) and make a large round circle. cut into 6-8 triangles and place onto lined baking sheet (or into your scone pan). I have not successfully made this recipe with a baking mix. My neighbor gave me this recipe and my son loves it as is –so I haven’t ventured to change a thing. This paleo/grain free version are more like traditional rounded scones in both taste and texture. They are not “fluffy” since only gluten can do that… but their taste is amazing and the scones are gratifying. Crispy on the outside and soft, muffin like in the inside. In a large mixing bowl (or in your stand mixer) combine eggs, pumpkin puree, honey, and vanilla extract. Mix until combined. Add in coconut flour, pumpkin spice, baking soda, and sea salt. Mix until combined. Remove chilled coconut oil and chop into small pieces, add them into the mix and combine. To shape the scones, simply measure out 1/4 cup and create a round ball like shape. Press it down so that it’s about 1″ tall. Alternatively, you can use a biscuit cutter to shape the scones. Place biscuit cutter flat on the baking sheet, fill it with 1/4 cup of dough. Press down with your hands to give it shape and lift cutter away. You will be left with a perfectly round shaped scone. Repeat with remaining dough. Bake for 20-25 minutes until the tops are golden. Remove and allow biscuits to cool on baking sheet prior to transferring onto a cooling rack. Combine all ingredients in a small bowl and whisk until coconut oil is incorporated into the mix. Once scones have cooled off, drizzle them with glaze. This recipe is a modification from this one – especially in the process and my glaze. I made the grain free version and they were awesome! I haven’t even glazed them. I wasn’t sure how they would come out because I tweaked and I didn’t measure some of the ingredients, but it is so adaptable, practically no-fail in my opinion. I substituted one egg with liquid cage free egg whites. I don’t use sugar, so I added 1/4 cup of coconut milk sweetened with a combination of stevia and xylitol., the coconut oil was a guestimate.. All in all, a great success. Next time, I will try small rounded drops full to resemble donut holes. I’m not sure which version of the glaze I will use, but I will have to make substitutions there as well for sugar, sunflower seed butter instead of almond butter, etc. This is a great addition to my fall recipes. It’s not easy to adapt to grain free, sugar free, diary free, and nut free cooking – this recipe sure helps!